A Woonsocket man led police on a high-speed chase through Woonsocket ending with his arrest west of town Saturday night. Ryan Schaller, 28, of Woonsocket was arrested for speeding, DUI, aggravated eluding and resisting arrest after leading police on a 20 minute chase through two counties. Schaller was clocked at 104 mph around a mile east of Woonsocket heading west when a state trooper called it in around 10:20 p.m. Deputy Jason Coenen joined the pursuit of the 2009 black Dodge Ram at the intersection of the Mt. Vernon oil in Woonsocket. Police followed Schaller west out of Woonsocket on 230th Street, or old Highway 34. Schaller proceeded at a high rate of speed and made multiple turns, heading into Jerauld County before doubling back to Sanborn County, in an apparent attempt to lose the authorities. Schaller eventually ended up back near the corner of 393rd Avenue and 230th Street where police put out a spike strip. Schaller ran over the spikes and continued on flat tires, turning east on 230th and reaching speeds of 90 mph, before stopping at a residence just about a quarter mile west of Woonsocket. Schaller was taken into custody. He was later released and is scheduled to appear in court Nov. 26. Aggravated eluding is a Class 6 felony and carries the maximum sentence of two years in prison and/or a fine of $4,000. DUI and resisting arrest are each Class 1 misdemeanors punishable by up to one year in jail and/or a $2,000 fine and speeding is a Class 2 misdemeanor punishable by up to 30 days in jail and/or a $500 fine. The South Dakota Highway Patrol, Sanborn and Jerauld county sheriffs offices and the Game, Fish and Parks assisted in the chase. Pictured are, in back, Co-Head Coach Tim McCain, Asst. Coach Justin Dean and Co-Head Coach Rob Baruth; seated, Shelby Selland. Shelby Selland, a senior at Sanborn Central High School, signed a letter of intent to play basketball at Augustana College next fall. Shelby is the daughter of Brett and Kelly Selland and is a senior at Sanborn Central High School. Shelby helped lead the Lady Blackhawks to a fourth place finish at the Girls State B in 2012 and a fifth place finish at the State B in 2013. She was first team Class B All-State as a junior and made the State B All-Tournament team in 2013. She was third team All-State as a sophomore and was selected to the State B All-Tourney team, as well. She has been first team All-Conference for both the 281 Conference and CBH Conference both her sophomore and junior seasons. She was also voted the CBH Conference MVP in 2013. She has scored 1,120 career points and has 614 career rebounds. “Shelby is a great young lady that has dedicated a lot of time in the off-season to becoming a better player and teammate. She is a player that listens to her coaches and teachers and is willing to do whatever it takes for the team to be successful,” says Co-Head Coach Rob Baruth. 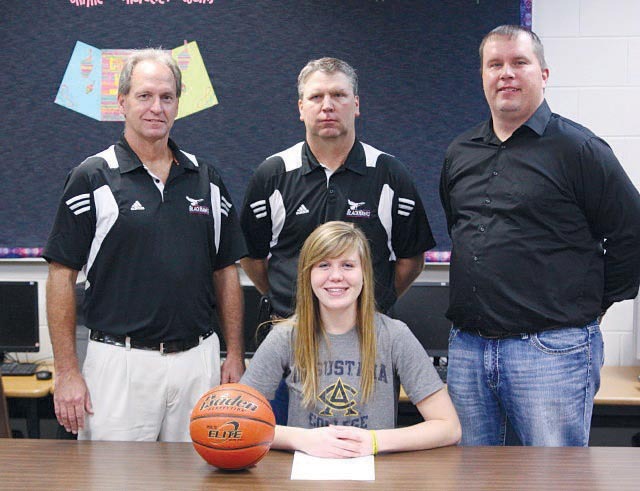 “Her work ethic is second to none, she will be a very good college player for Augustana!” added Co-Head Coach Tim McCain. 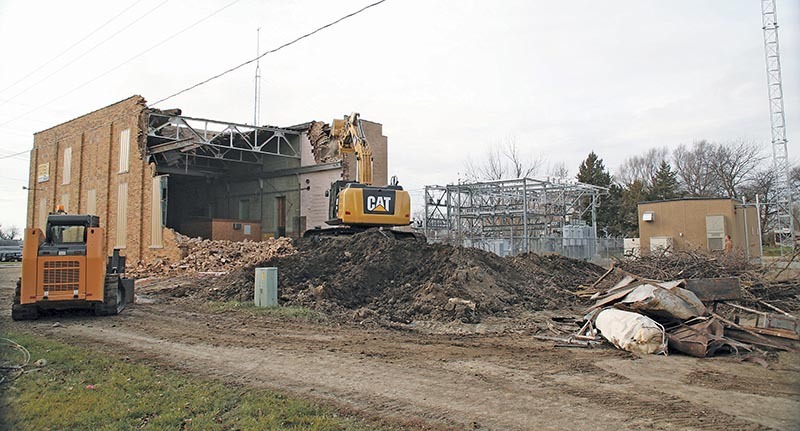 The old NorthWestern Public Service, now NorthWestern Energy, building just west of Woonsocket’s main street was demolished on Tuesday. NorthWestern recently finished the construction of a new, much smaller building for the substation (shown at right). Todd Brueske Construction of Woonsocket was hired to tear down the old structure.